Our final article about the Arctic Research Program (ARP) brings us to the Distributed Biological Observatory (DBO). 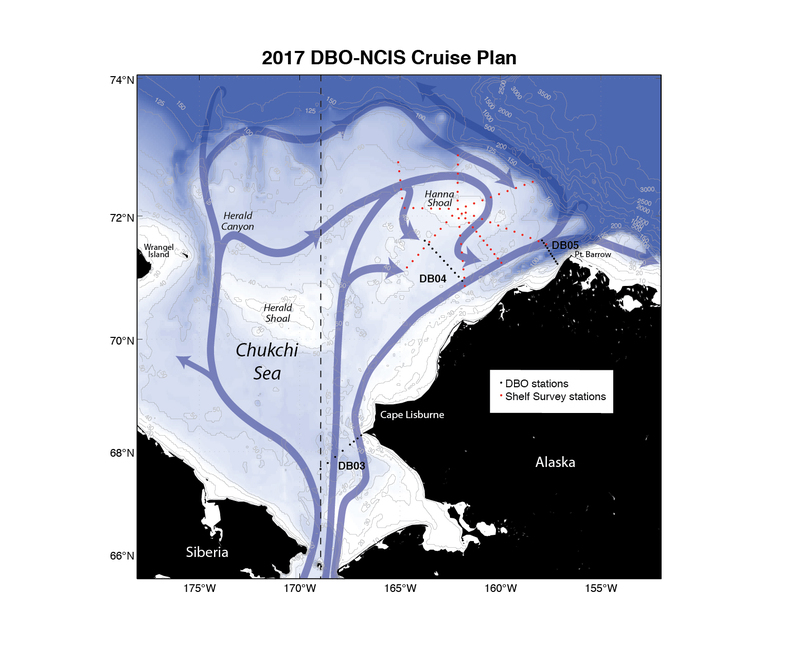 The DBO is a multidisciplinary Arctic ocean sampling program that is a collaboration between multiple U.S. federal agencies and academic institutions as well as from other Arctic nations, including Japan, South Korea, China, Canada, and Russia. The objective is to track biological responses to the changing physical environment in the Arctic There are eight designated “hot spots” across the Bering, Chukchi, and Beaufort seas where multidisciplinary sampling is focused. These “hot spots” have been chosen because of their high concentrations of ecosystem productivity, biodiversity, and overall rates of change. The sampling area extends from the northern Bering Sea to the Barrow Arc and eastward to Cape Bathurst in the Canadian Beaufort Sea. The Arctic is very difficult and expensive to sample on an annual basis. Given these limitations, another important funciton of the DBO partners is the coordination and sharing of data with scientists from institutions in the international Arctic science community, via the work of the Pacific Arctic Group. This group meets twice a year to share data and discuss analysis of that data. As part of the US contribution, the Arctic Research Program supports an annual cruise onboard the icebreaker, US Coast Guard Cutter Healy. The USCGC Healy can operate in conditions of -50⁰F, while supporting up to 50 scientists and providing over 4,200 feet of scientific laboratory space. The capabilities of the vessel allow scientists to reach remote areas and stay on the water for an extended period of time. By being on the vessel and conducting real time sampling, scientists can make modification to the sampling strategy. This flexibility of being able to change the sampling pattern, was used on the most recent cruise in the Arctic. The highly productive Hanna Shoal region on the Northern Chukchi shelf was added with a star sampling pattern. These additional research stations allowed scientists to more closely observe phenomena within the study region such as an unusual harmful algal bloom and several cold-core eddies that were detected within the complex hydrography of the Hanna Shoal region. This year’s cruise left from Dutch Harbor, AK for the Northern Chukchi Sea. More than 40 scientists were on board the USCGC Healy to measure a range of variables from atmospheric aerosols to the abundance of benthic organisms such as worms, clams and brittle stars. The science party included both federal and academic scientists, graduate students and NOAA Sea Grant Knauss Fellows. Principal Investigators Dr. Robert Pickart (Woods Hole Oceanographic Institute) and Dr. Jacqueline Grebmeier (University of Maryland Center for Environmental Science) devised a 21-day cruise track to sample across the Distributed Biological Observatory, including the new stations in the Hanna Shoal region. The uniquely interdisciplinary group of researchers on board allowed scientists to draw direct connections between their observations. For example, marine mammal observations could be linked to the observed abundance and diversity of benthic organisms (their food source), which is often influenced by the temperature and chemistry of seawater. Part of the researchers were there with the goal to sample a total of 100 stations but returned back to port having sampled nearly 160 stations due to favorable weather and the total lack of sea ice. In addition to onboard science, several buoys and drifters were deployed and a calibration experiment was conducted with autonomous vehicles (Sail Drones) that were also sampling in the Chukchi region. The Arctic Research Program looks forward to supporting another Arctic research cruise during the summer of 2018.